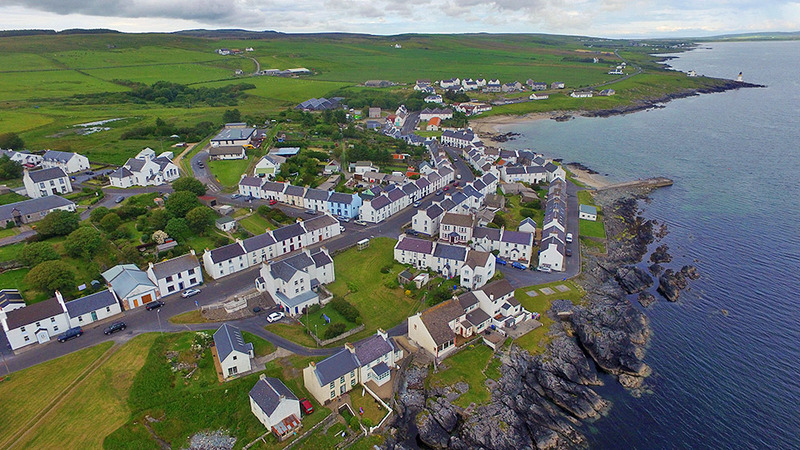 An aerial view of Port Charlotte on the Rhinns of Islay in early July 2015. Main Street stretching through the village leading to the road north to Bruichladdich (just visible in the distance), Shore Street with the pier on the right. School Street left to right with the current school in the square modern building towards the left. The former Loch Indaal distillery in the centre distance, some of it still in use as warehouses, some now used by the youth hostel and the INHT. The Loch Indaal lighthouse is on the top right. This entry was posted in Beaches, Cloudy Weather, Distilleries, Islay from the air, Landscape, Lighthouses, New Post, Sea Loch, Village and tagged Bruichladdich, Islay, Loch Indaal, Port Charlotte, Rhinns of Islay by Armin Grewe. Bookmark the permalink.